Chief financial officers (CFOs) must master more than cash flow and revenue models; they must be strategic partners in the business. Research indicates that there is a growing gap between the importance of core finance responsibilities and broader strategic questions affect a company’s long-term success. When surveyed, CFOs frequently say CFOs say their finance organizations are not effective in the areas of strategy, information integration, and risk and opportunity management. In today’s finance matrix organizations, managers report to a local business unit leader and a corporate CFO — a structure that can create distrust with their primary client. 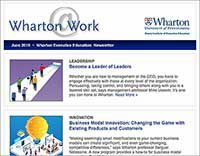 The Wharton School offers a comprehensive five-day Executive Education program, The CFO: Becoming a Strategic Partner, that can be customized for an organization. 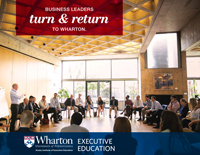 The program is designed to elevate finance leaders’ business acumen, strategic thinking, and communications skills. New ways to use financial tools to help non-finance colleagues see if a strategy or investment will succeed. Frameworks that expand participants’ strategic thinking skills and make them proactive, rather than reactive, advisors. Techniques to simplify the technical jargon of finance and communicate financial insights to non-financial leaders with greater impact. From the team-building exercise to the course content to the sessions that focused on influence and persuasion, finance managers from Paris-based Schlumberger, the world’s leading oilfield services provider, are using program learnings to influence company leaders on the financial implications of key decisions. Move from being cost reduction oriented to being growth oriented. Use valuation tools in new ways to assess the performance of the business, especially during the bidding process. Realize how the organizational structure of the business can affect the way people behave. Adapt their communication skills to more effectively influence and persuade others inside and outside the organization.